As part of the 9th World Congress for Hair Research (WCHR), tissue regeneration specialists Samumed, LLC announced its preliminary analysis of data concerning the efficacy of its potential genetic hair loss treatment from its Phase II trial. In addition to data from the previously completed Phase I study, the Phase II trial’s safety results were also presented at the four-day conference. According to a press release issued by Samumed, LLC, attendees heard how one of two tested dosage arms showed ‘statistically significant increases for both objective outcome measures: non-vellus hair count (a primary outcome measures) and hair density (a secondary outcome measures), using the pre-specified statistical model’ when compared to the vehicle. The hair loss drug being investigated in these trials is a topical solution version of the company’s novel small molecule compound SM04554. This suggests it would be applied in a similar way to the clinically-proven male and female hair loss treatment, minoxidil. 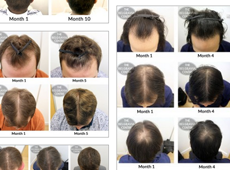 However, whilst minoxidil is suitable for both men and women, this drug’s clinical trials focussed solely on assessing men with male pattern baldness – no participants with female pattern hair loss were included. Representatives from Samumed only gave a brief outline as to the initial findings of their most recent clinical trial results as the 135 day study data is still being properly analysed. Researchers investigated the safety, tolerability and efficacy of two different doses of SM04554 over a 90-day treatment period and for a further 45 day follow up period post-treatment. Their stated primary aims were listed as the ‘objective quantification by macrophotography of non-vellus hair count, and the subjective assessment of hair quality by subject-completed Men’s Hair Growth Questionnaire’. As the company previously announced, there were no serious adverse reactions or side effects observed in any trial participant during the Phase II study, and the incidence of adverse events was described as being ‘similar between treatment and vehicle groups’. “The Phase II safety and efficacy data so far are very promising and support moving this program into pivotal studies. We are analysing the efficacy data further and plan to present results of both pre-clinical and clinical studies at upcoming medical conferences,” said Yusuf Yazici, M.D. – the company’s Chief Medical Officer. Any new treatment that gives hope of a safe and effective way of treating hair loss is exciting, but as such little information is available regarding what the treatment involves, how it works to regenerate hair follicles and whether it works better or not on different levels of hair loss, we look forward to the promised updates. Given the short length of this study, we would hope to see on-going, wider-ranging and longer-term studies carried out to better assess the suitability this potential male hair loss treatment. We would also hope to see the study expanded to include women with androgenic alopecia, as well as hearing the MHRA and FDA reports when the time comes. In the meantime, effective hair loss treatment options exist for both men and women with thinning hair who want to stabilise their hereditary shedding and regrow lost hair. 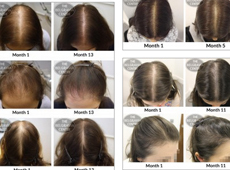 Many examples of just how compelling the results can be are available in our gallery of Belgravia clients’ Hair Loss Treatment Success Stories.